I've been asking Hubby what he wants to do today since Thursday. I've been met with grunts, face pulling, and no actual answer. I offered to take him out for lunch, he didnt want to. I suggested a picnic in the park with the kids, he pulled a face looking at the weather. I asked where he did want to go because staying in all day with the kids would lead to them playing up and did he really want to spend the day telling them off? But at bedtime last night there were no plans made. Except that he didn't want breakfast in bed, he wanted a fry up instead! Fine, not a problem, only if I'd known sooner I could have gone to the shop! Now I have to to the local shop at opening time to get stuff in. 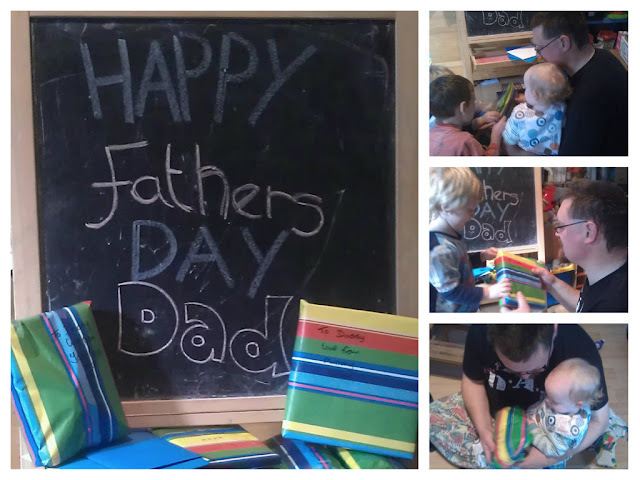 So we get up this morning and the kids give Daddy their gifts and cards. I clock watch waiting for the shop to open. Then hubby says he DOES want a picnic after all! Or a takeaway for tea... I give him a look. "Which?!" I demand in the basis that I'm going to the shop NOW and if it's either picnic stuff or cash for a takeaway I really need to know. He plumbs for takeaway. Me and the Big Lad head out to the shop. As we walk down the hill we see the shutters are open! Hooray! But when we get there we're not allowed in! There's been a mix up with the keys and its going to at least half an hour before its open for business. There's another shop 10 mins walk away (15 mins with a child) so we treck off there. No black pudding, no crumpets. Damn. Still we pick up some bacon and I thank my lucky stars that I know we have sausages, eggs & bread at home. When we get back I find the bread has gone mouldy. No way am I heading back out! We just do without toast. The morning's not too bad. Hubby puts the Wii on and the kids LOVE being allowed to play it in the morning (a rare treat, Wii time usually has to be earned), especially with Daddy, but its only a matter of time before Jack starts acting up. He's really really struggling with a days focus being on someone that's not him at the moment. By the time we get round to a late lunch he's been sent for a time-out at least twice. It puts a real shadow on the day, and is exactly what I was trying to avoid by repeatedly suggesting we went out for the day. Hubby attempts to gain some control over the situation by saying IF Jack behaves he might be allowed to play with the new Skylanders he got today. Jack's behaviour improved but only a touch. I have to go BACK to the shop for bread after all. We need it for lunch, and for the packed lunches for Monday & Tuesday too. Doh! I pick up some picnic type food and we have lunch watching telly! We watch a few movies in the afternoon and then we do end up with Skylanders on the Wii until our take-away tea arrives. Before we know it, it's half an hour past the kids bedtime and we need to get sorted because it's school tomorrow. The kids think they had a good time in the end. Funny how they seem to forget the times when they got fed up of the movie that was on, started to fight over a toy, fell over & got hurt because they were running in the house.... All the things that give me a banging headache. And when I ask Hubby if he's had a good Father's Day? "Aye... it's been all right." Well... that'll do for me! Soooo glad it's only once a year!